I presume this was taken in 1903 or early 1904. 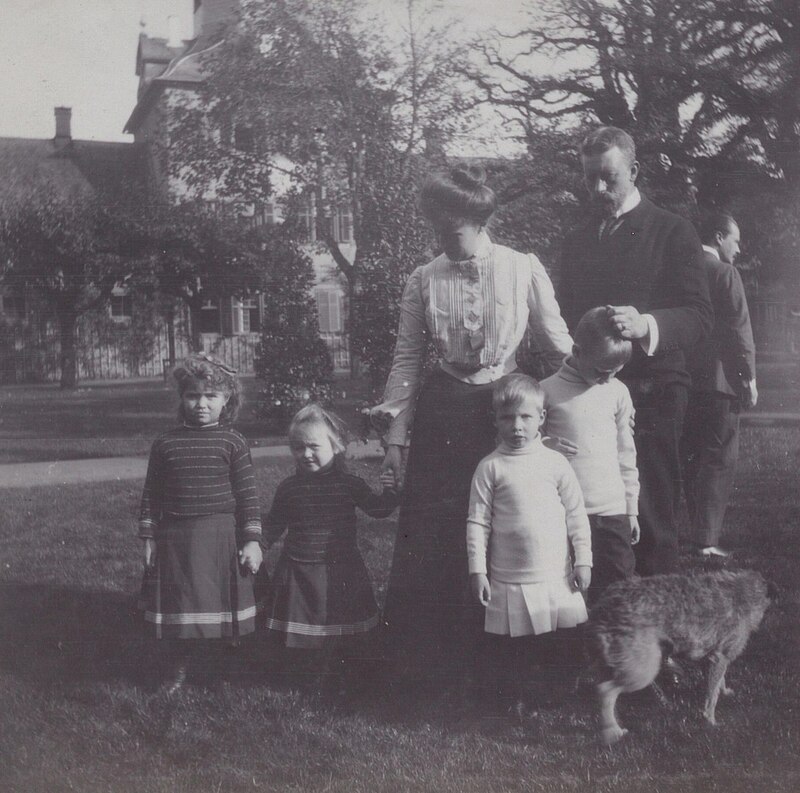 I think the smaller boy is Prince Henry? If so, this may be one of the last photos of him taken, or at least the last one of him with relatives. Did Nicholas ever form an opinion on Count Belevsky? Did they ever meet? IIRC, GD Alexei was Nicholas' favorite uncle, so I was curious if they ever crossed paths. Nicholas was only slightly older. GD Sergei was evidently quite fond of the Count. 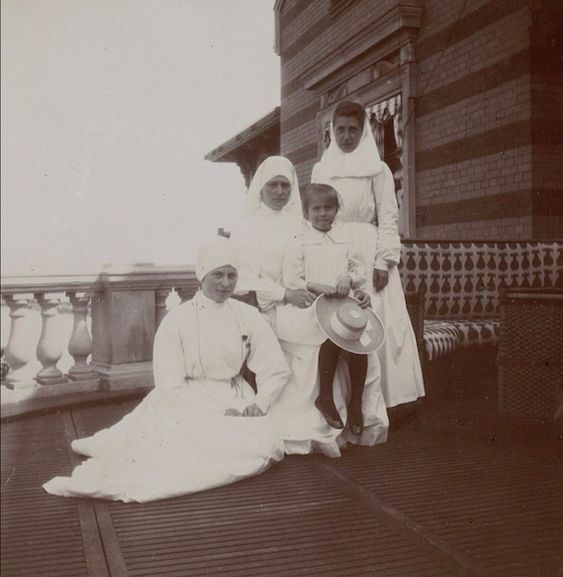 Grand Duchess Anastasia with her mother, Alexandra and two nurses when Anastasia had diphtheria. 1907. Anastasia either has her hair up or has it cut, maybe because the medicine made it fall out? Oh wow, I never knew Anastasia had Diphtheria. I'm curious if anybody knows the reaction of Woodrow Wilson? He didn't like the Russian Monarchy, but he also didn't like the Bolsheviks. Did he ever release a statement, or tell someone word of mouth what he thought? I've never been able to look at the above photo without a shudder. Smoking while laying in a haystack seems awfully dangerous. Yeah, that's not really the best idea. Especially when you're sleeping/napping. Tsar Nicholas II jokingly allows his daughter, the Grand Duchess Anastasia, to smoke. Actually Nicholas allowed his daughters to smoke; giving them cigarettes which they said were gifts, and would smoke them happily. I think there's a picture of Olga smoking too. But yeah, they didn't smoke them jokingly. Maybe for this picture, as Anastasia may have been a bit too young for the time, but I don't think Nicholas is letting her jokingly allow her to smoke in this picture. There are some photos from 1915/16 with the girls lying in a bale of hay and one of them (Anastasia I think) was smoking. I don't think anyone yet understood the health risks that smoking presented back at that time. Anastasia Nicholaievna / Re: Anastasia May Have had a Crush? I've read the "Journal" you're referring to and I was always under the impression that it was "Fan Fiction"; Something a Romanov admirer wrote about the Grand Duchesses on a blog site. If I recall, there are actually several of these "Journal entries". I would be shocked if these were real entries from a real Imperial Guard. Perhaps another poster could corroborate? Having grown up in Switzerland, is it possible that Gilliard knew any German or Italian? I haven't seen or read anything that suggests so, but many Swiss people do speak French, German, and Italian. Obviously he knew French, and I'm certain he knew Russian, but I'm not sure whether or not he knew English well either. Maria doesn't seem particularly pleased with George's arm draped around her. Perhaps she was shifting position as the photo was taken? Edit: On second thought, I think it's just the way she's sitting. Never mind. I'm glad this thread was created so I didn't have to make another. Maria was also the first Romanov that caught my eye. About two years ago, I knew absolutely nothing about the Romanovs or European royalty at all for that matter. One day in (September if I recall correctly) 2015 is when I saw a picture of Maria online for the first time. I was on Wikipedia, and I was going through pages related to World War 1 I believe. I can't remember EXACTLY what I was reading about, but it was something relating to WW1. (It may have even been Franz Ferdinand). Anyways I was just clicking on related pages and links to other WW1 related pages doing some reading and needless to say I 'stumbled' across the Wikipedia page for Maria. She was the first Romanov I became 'interested' in, for lack of a better term. I had already heard of Anastasia, but I knew pretty much nothing of her backstory. I was stunned looking at Maria in that photograph. It was a picture of her from a 1914 photo shoot. In fact, I think it's still her 'featured' photo on Wikipedia. Honestly for a good 10 minutes I was almost in a trance looking at her; (I wasn't literally in a trance, but you get the picture) She was absolutely stunning, but that "trance" quickly turned into heartbreak when I began reading about what happened to her and the rest of the family. For a good 5 months after that I went on a Romanov learning binge, and I still like discussing the topic to this day. Funny what a little "boredom surfing" on Wikipedia can bring about. Of course since then I've read about the rest of the Imperial Family (NAOTAA), along with other Grand Dukes, Grand Duchesses, relatives, etc. BTW Hutch, what about that 'Russian Survey Course'? Did anything ever come about?